Federalism is a system of government with one, strong, central governing authority as well as smaller units, such as states. If the central government grows too strong, then federalism comes closer to a unitary state, where the governing body has supreme authority and dictates how much power the units are allowed to have. Argentina - It has 23 provinces and Buenos Aires is an autonomous city. Australia - In 1901, Australia became the Federation of Australia which established the Commonwealth of Australia. The seven individual states were still colonies of the UK until 1986 when Australia and the UK passed the Australia Acts. Austria - It has nine states and is a semi-presidential, parliamentary representative democracy. Brazil - There are 26 states in Brazil with one federal district. The monarchy fell in 1889 and Federalism was established in 1891. Canada - Established in 1867, its government is considered Federalism because of the division of powers between the federal parliament and the provinces. 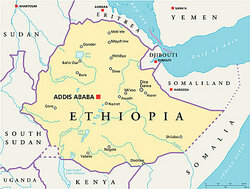 Ethiopia - There are nine regions and two cities that are chartered. It became the Federal Democratic Republic of Ethiopia in 1994. Germany - There are 16 states in Germany. In 1949 the Federal Republic of Germany was formed and Germany was reunified in 1990. India - There are 28 states and seven union territories in India. The Constitution of India established the Republic of India as a federal union in 1950. Mexico - It has 31 states and one federal district. Nepal - There are 13 zones in Nepal. In 2008, it became a federal multiparty representative democratic republic. Nigeria - It declared itself a federal republic in 1963 and has 36 states and one federal territory. Pakistan - It has 4 provinces, two territories and two autonomous areas. Sudan - In 1993, twenty-six states were created which made Sudan a federal republic. Venezuela - It has 23 states, one federal dependency and one capital district. Asymmetric federalism is a federal state where not all the constituent states have the same autonomy. In other words, the division of powers is not symmetrical. Iraq - Iraqi Kurdistan was a separate entity from other states in the federation until 2003 when it joined the federal democratic Iraq. It is the only region with economic and political development. Malaysia - There are 13 states in the Federation of Malaysia, formed in 1963. Sabah and Sarawak have more autonomy than the other states. Russia - There are 83 federal subjects in Russia but with different levels of authority. Some smaller entities, such as the republics, also have more autonomy than states. United States - Among the 50 states, there is symmetric autonomy, but the District of Columbia is directly controlled by the federal government. Belgium - A reason for asymmetry in Belgium is the fact that there are three established languages, French, German and Dutch. Switzerland - There are four official languages in Switzerland, which leads to asymmetry in their government. Bosnia and Herzegovina - This region has two parts: The Republika Srpska and the Federation of Bosnia and Herzegovina. Cyprus - The 1960 Constitution of Cyprus would have been a federal union with two sides, but the Greeks and Turks did not unite. Czechoslovakia - This country had two parts until the Czech Republic and Slovakia separated in 1993. United Republic of Tanzania - This was the union of Tanganyika and Zanzibar. The Federal Republic of Cameroun - It existed between 1961 and 1972. The Federal Republic of Yugoslavia - in 2003 it became the State Union of Serbia and Montenegro. It ended in 2006 when Montenegro declared its independence. Now you have some examples of federalism and can see how many different locations use federalism as a system of governing. "Examples of Federalism." YourDictionary, n.d. Web. 23 April 2019. <https://examples.yourdictionary.com/examples-of-federalism.html>.